It’s a very rare place, in the American South, where Robert E. Lee is an afterthought. 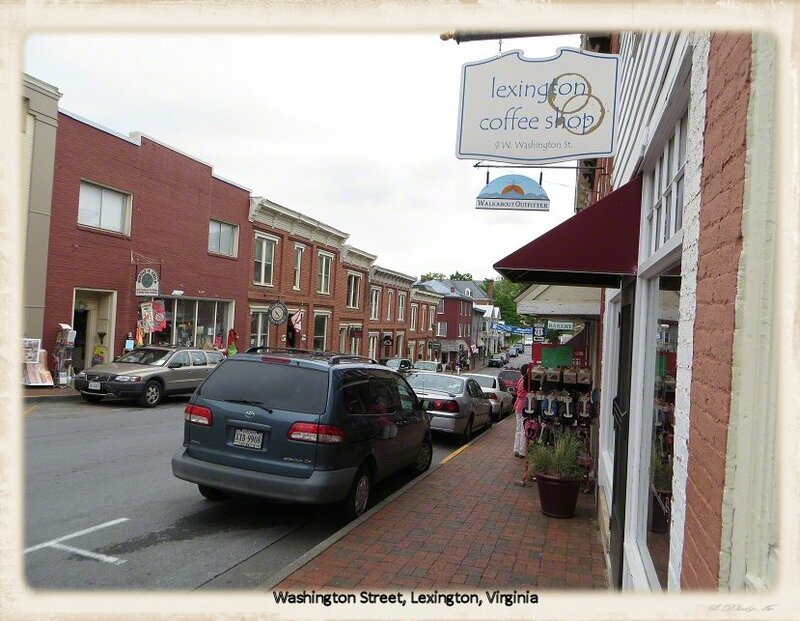 If there is such a place, it would be Lexington, Virginia. 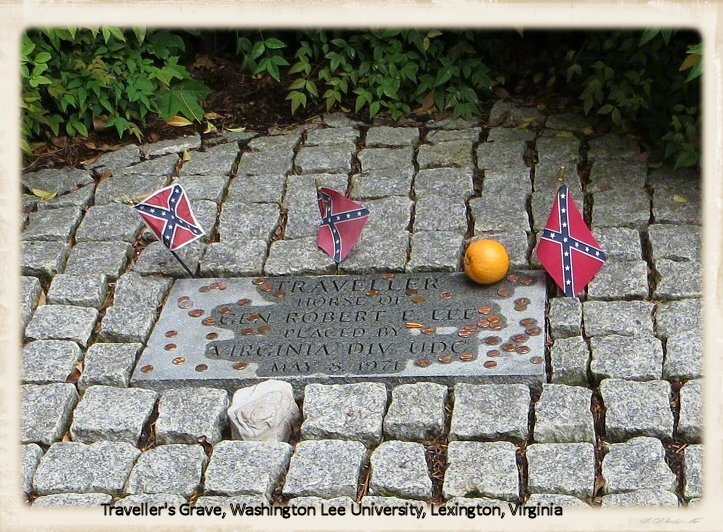 Sure, Lee – and his horse, Traveller — are buried there. But Lee is not The Man in Lexington. Who is? 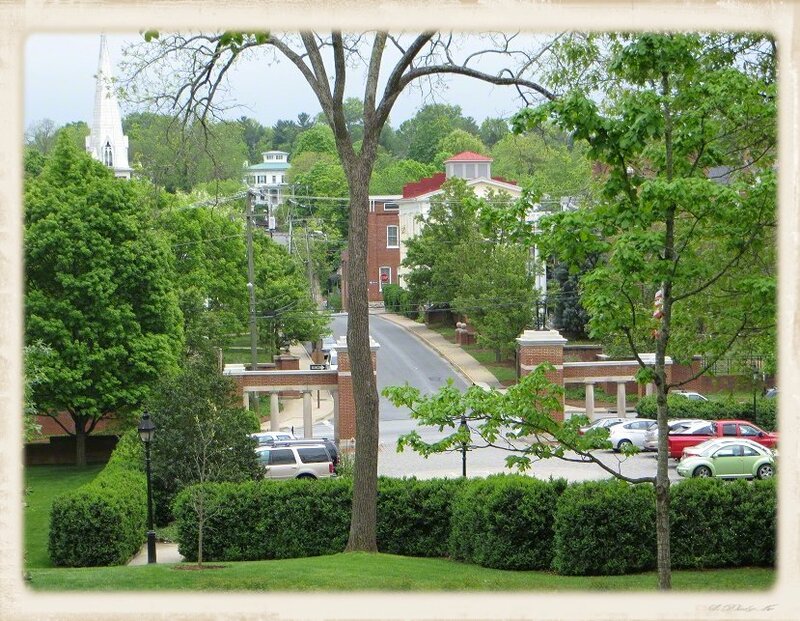 Let’s just say that in Lexington, Lee is half of Washington Lee University. On the other hand, there’s the Stonewall Jackson House, the Stonewall Jackson Monument and, in a good example of bad city planning, the Stonewall Jackson Hospital next to the Stonewall Jackson Cemetery. Jackson lived in the house and is buried at the cemetery. Not to be outdone by Traveller, Jackson’s horse, Little Sorrel, is buried in front of the Jackson Monument. My husband and I stopped in Lexington for a couple of nights at end of our recent Georgia/North Carolina trip, not only because it was a convenient midway rest between Asheville and DC, but because it’s on many “best places to retire” lists. And my husband and I are at that age when retirement is taking up much of our thoughts and conversation. The lists were right: Lexington is a small, charming town set in the beautiful western foothills of the Shenandoah Mountains. It’s a lot like Asheville – though nowhere near as big — in that it’s got a more affluent and artsy feel than its rural Appalacian setting would suggest. There’s upscale shopping, upscale restaurants, and horse drawn carriages clippity clopping tourists down its narrow, 18th century streets. As for its history, it’s not a “big event” place. Its biggest claim to historical fame, after the presence of Lee and Jackson, was a minor Civil War event in which the Union laid siege to Lexington and burned down most of the Virginia Military Institute (VMI), on the edge of downtown. There’s a large visitors’ center located midtown, with a parking area where we could leave our car for the day. 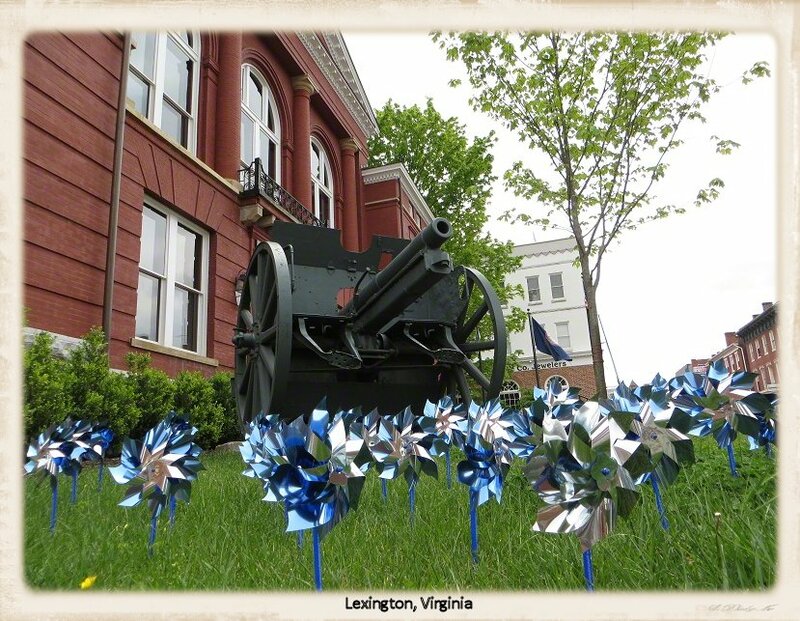 It was an easily walk from there to all the historic sites – the Jackson House, the Campbell House, the Lee Chapel, VMI and the Jackson Cemetery — in downtown Lexington. 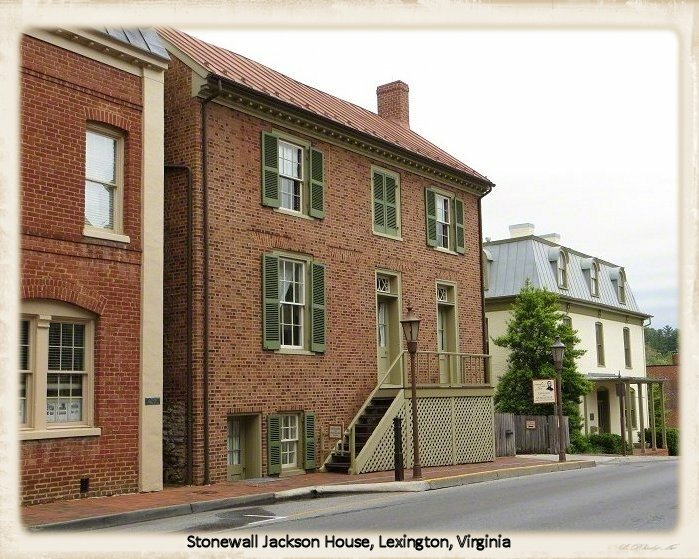 The Jackson House, home to Stonewall while he was teaching at VMI and the only house he ever owned, is one block from the visitors’ center. The 19th century Campbell House, headquarters of the Rockbridge Historical Society and featuring exhibits on Rockbridge County history, is across the street. Both are open for tours. 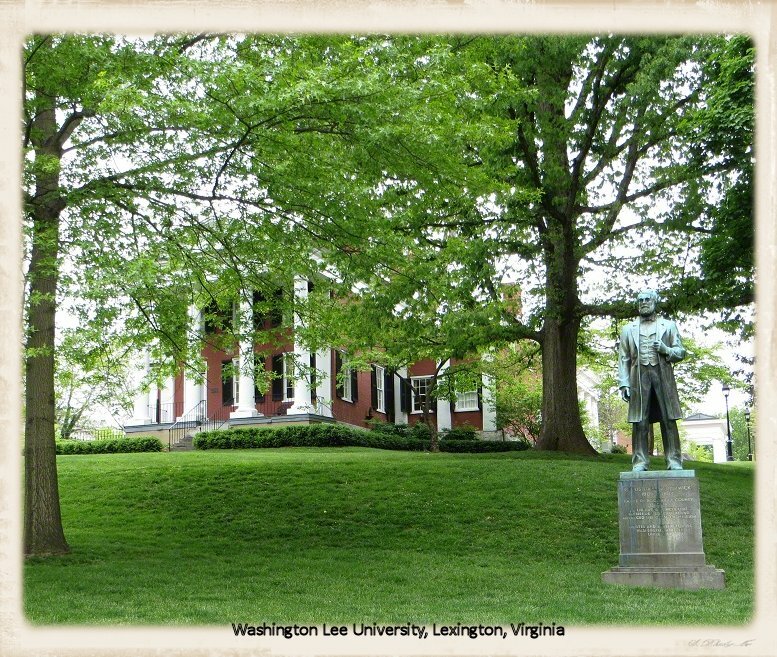 We kept going past the Jackson House and in another block, we reached the campus of Washington Lee University, where Robert E. Lee was president during the five years before his death. In 1796, George Washington gave the school, then called Liberty Hall Academy, $20,000 in stocks. It was the largest gift ever given a school at the time, and recognizing a good thing when it saw it, the school changed its name to Washington College. It became Washington Lee after Lee’s death. The Lee Chapel, commissioned by Lee in 1867, is close to the school’s main gate. 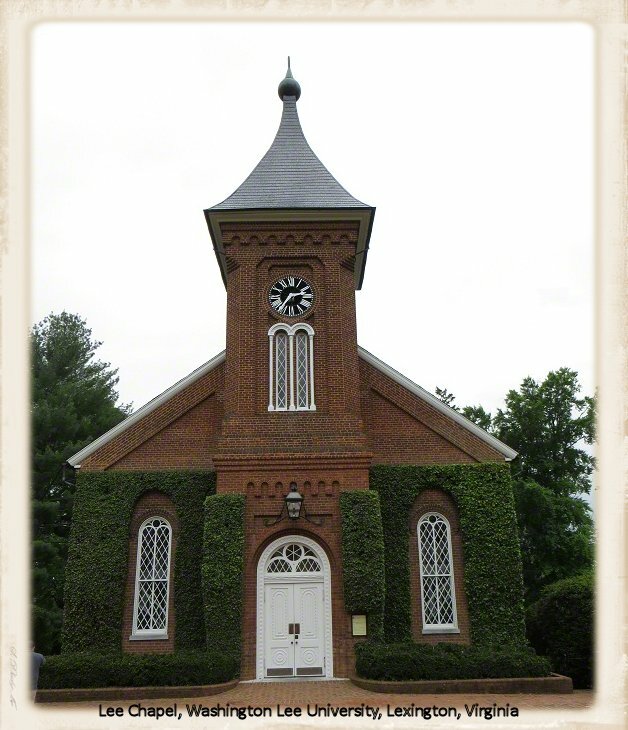 It never functioned as a house of worship; Lee attended an Episcopal church a few blocks away. But the interior of the main floor is set up like a church, with one interesting exception: there’s what looks like a white marble sarcophagus, at the front, where an altar normally would be. It’s not a sarcophagus but an effigy of Lee in uniform, sleeping under a blanket on a cot. I’m sure there are lots of good discussions to be had about the meaning of its placement in the chapel. Lee and his family are buried on the lower level, where there’s also a museum of Lee artifacts. There are docents in the chapel to guide you through, and no taking pictures inside. Traveller is buried just outside of the doors as you come out of the museum. There are no other campus buildings generally open to visitors, but there are student lead tours of the campus when students are in residence. VMI adjoins Washington Lee to the northeast. My next post is about VMI, so that’s it for VMI here. There are lots of historic inns and B&Bs in and around Lexington but we were traveling with our extra-large dog and couldn’t find a pet-friendly one. So we stayed at the modern Fox Hill B&B, an easy 15 minute drive outside of town and loved it. It’s a large, luxurious log cabin, built to be a B&B, with huge rooms, 38 beautiful acres, gourmet breakfasts, horses and a very friendly donkey, and friendly but unobtrusive owners. Our favorite Lexington restaurant was the Southern Inn: kitschy retro on the outside, sleek and modern on the inside. Gallery | This entry was posted in Virginia and tagged dog-friendly, hotel, Lexington, restaurant, Robert E. Lee, Stonewall Jackson, travel, vacation, Virginia, Washington Lee University. Bookmark the permalink. 2 Responses to Robert E. Who? Great post. Lexington is definitely going on my list of places to visit. You’ll definitely find it worthwhile, especially since you’re a Civil War reenactor. Something specific you may be interested in: every May, in memory of the Virginia Military Institute cadets who died at the Battle of New Market, a group of cadets march the 81 miles from Lexington to New Market to participate in a reenactment of the Battle.